In recent weeks there has been much discussion about who is eligible for Estonian citizenship. The issue came into the spotlight with the case of Alli Rutto, an Estonian residing in Abkhazia who was granted Estonian citizenship in error. So who is an Estonian? True Estonians are ethnic Estonians. Estonians by blood. This means one or both parents are ethnic Estonian and can trace their heritage back in Estonia for generations. Estonia also granted citizenship and cultural autonomy to all ethnic groups living within its border upon independence in 1918. These groups included Germans, Russians (particularly Old Believers), Jews and Swedes who had likewise lived there for generations. For these people Estonian citizenship is a birthright and, as long as their families were citizens of Estonia during the first period of independence (1918 - 1940), they can apply for a passport. When Estonia achieved independence and the Treaty of Tartu was signed in 1920, there were thousands of Estonians living abroad. My family were among these people. My great-grandfather worked in Finland for many years before seeking new opportunities in Russia. He married his Estonian wife in St. Petersburg in 1913 and lived in an Estonian community there until 1921. After the Treaty of Tartu was signed those Estonians living abroad had one year to claim their Estonian citizenship and resettle back home. Thousands of people did return to Estonia, my family included. During my genealogy research I viewed my family's Estonian citizenship application in the Estonian National Archives. Besides supplying documents such as birth records they also had to have three people personally vouch for them to prove they were indeed Estonian. 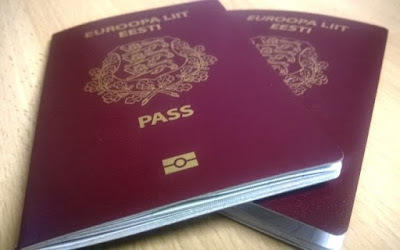 Estonians by blood cannot lose their citizenship and their descendants are automatically Estonian citizens regardless of where they were born. It is considered their birthright. This is particularly true with the Estonian diasporia. Thousands of Estonians fled Estonia because of the Soviet occupation but they would have stayed had the country not been occupied. These people kept the Estonian language and culture alive in all corners of the globe. Regardless of where they live, they are still proud Estonians. I belong to this Estonian diaspora and even though I was born in Australia I grew up with Estonian culture and a deep love of my ancestral homeland. I identify as Estonian because my family are and it has always been a part of me. Most of the things I do regarding Estonia, namely this blog, is in honour of my Estonian grandparents. I know they would be very proud that I have reconnected with my roots and claimed my Estonian citizenship. Estonian citizenship can be acquired but is a lengthy process. This is a good thing because Estonian citizenship should not been taken lightly. You need to prove that you are willing to contribute to society and respect Estonia's customs and traditions. I commend anyone who can master the Estonian language and is willing to brave the harsh cold winters! Good luck to them!